THE STORY - Libby Lamm is a former top national security adviser who, while working with a ruthless, steely-willed political veteran, signed off on a controversial military action that was supposed to end the war on terror. The problem: thousands died under false pretenses. Haunted by what she knows, Libby sets out to tell the truth, risking treason -- and her own life -- to expose a cover-up that stretches all the way to the top. THE GOOD - Tika Sumpter and especially Ben Tavassoli give solid performances that are interesting to watch. The film also asks some valid and important questions about war. THE BAD - The film is shoddily put together, with poor pacing, forced tension, and a heavy hand. 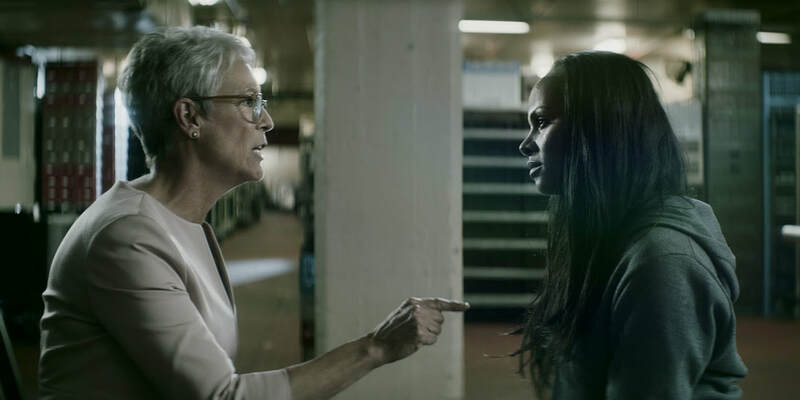 ​​“An Acceptable Loss” is a new political thriller from director Joe Chappelle, that follows a woman after a controversial time working for the government. She’s hated because of decisions she made and is hunted by people on all sides who want her silenced. Despite asking some important questions about the cost of war and the government’s involvement in it, “An Acceptable Loss” never materializes enough momentum to make the audience care. When a former government official, Libby (Tika Sumpter), takes a position at a university in Chicago, she finds herself surrounded by controversy. Students are protesting her hiring because of decisions she has been blamed for during her time as a Security Adviser. During her time working for Vice President Burke (Jamie Lee Curtis), they were responsible for a military action in the Middle East that killed thousands of innocent civilians, many of whom were women and children. Libby has taken the brunt of the blowback from the incident, but there’s clearly more to the story. That story should be boiling with tension, pulling the audience into the intrigue and mystery of it all. Unfortunately, the poor pacing and uneven editing prevent us from getting invested from the start. The film cuts back and forth between the present day, as Libby begins at the university, and the past, when she worked with Burke. While it cuts back and forth, we don’t get truly invested in either timeline. Slow pacing pushes the audience away rather than draw us in. So little actually happens for so much of the film that it had already lost me by the time it tried to inject real intrigue or action. While Libby begins to teach at the university, a student named Martin (Ben Tavassoli) begins to develop a stalkerish obsession with her. It’s clear that he was somehow affected by the explosive incident that Libby is blamed for. What’s unclear is why exactly he’s stalking her. For much of the first half of the film, this feels almost completely disconnected from the rest of Libby’s story. That’s likely another result of the slow pacing that keeps us from fully engaging in the story. Sumpter and Tavassoli’s performances help to elevate the film as much as they can. Tavassoli’s character would be easy to get wrong, especially when surrounded by some really annoying supporting characters (like his roommate). Still, he brings a level of believability to the stoic role that was desperately needed. Sumpter does the same, committing fully to the material in every way. Her character has a lot to do, even when some of those things are pretty silly (like living with no phone, computer, or internet of any kind). On the other hand, Curtis disappoints here. The character of Burke is meant to be a menacing, hugely intimidating character, but that’s never fully accomplished in the small amount of screentime she has. This sort of thriller relies on some sort of twist that you’re anticipating from the first frame. “An Acceptable Loss” never truly delivers on that promise. There’s a twist of course, but you can see it coming from a mile away. The film does ask important questions about the cost of war, but the questions are so obvious that the answers don’t hold our attention by the end. And it’s all shot in bland cinematography made up of washed out shades of grey that’s pretty unpleasant to look at. It asks all the right questions but can never materialize a film that has anything new to say in response. This is a tough film to get right. It takes a strong voice to comment on massive issues like these. Ultimately, “An Acceptable Loss” never got these. It’s a subpar thriller with a couple of decent performances within, and not much more.